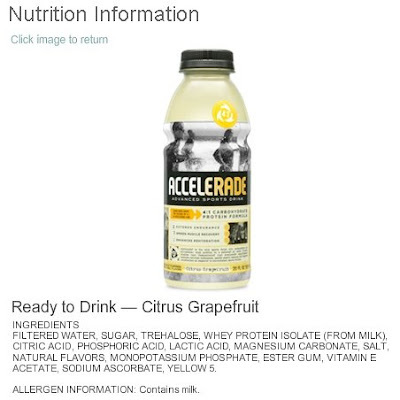 Accelerade in ready-to-drink form makes it easy to take it with you. We think you'll find that's a good thing. 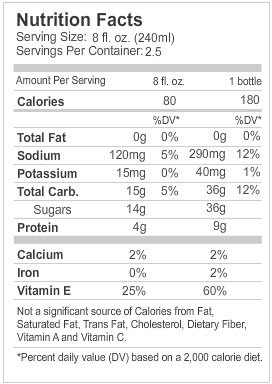 Because when you're out training or recovering from that last long, hard session, our patented 4:1 ratio of carbs to protein will be within arm's reach. And you'll be seconds away from increased endurance, quicker recovery and better rehydration. So, get your hands on it. In fact they have scientific proof about how it works and how good it is for you. After reading it, I have to say it makes sense to me. What I like about it is it's not too sweet so after I finish a bottle I am not craving more. In fact, the way I use it is either pre-ride prep and for really long rides bring an extra bottle and take sips along the way interspersed with water. Post ride, I feel much better than if I were to drink a Redbull or a Monster. Big Y in Newtown and Bethel used to carry it but it seems it didn't sell too well and they don't any more. Seems 7-11 and Stop & Shop still do, so when I run from what I was able to get at a discount from Big Y, I 'll be heading to Stop & Shop to replenish my supply. I guess I should try their powdered version as well. I have had three of these this week, all prior to riding and for an hour ride, I didn't need to sip from my camel. On the 2.5 hour on Tuesday, I took some sips but I felt great and never at a loss for energy, even post ride. Definitely recommend this!